“Somewhere, over the rainbow, way up high, there’s a land that I heard of once in a lullaby…” Welcome to this cosmic connection of artists, from different parts of this magical planet Earth, all united in offering you, the listener, a colorful vessel ready to carry you to the realms of your dreams. 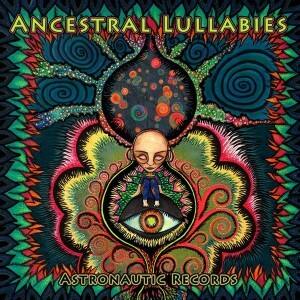 Lullabies are ancient music tools, they offer a passageway to other dimensions. Protected by the positive vibrations you can freely walk the bridge to the subconsciousness, float through inner and outer space, and fly, innocent as the child living deep in your soul. Wishing you a soothing time in the cradle of Ancestral Lullabies! Mastering by Keamia at Reflektive Media with artwork by Catalina Chirila. MP3 Download | FLAC Download | WAV Download · Download count: 10,605. Excellent collection of artists. To listen and enjoy! Great release! Can’t stop listening to this compilation. Can’t point any favs either, they’re all great and unique! 100/5 stars, thanks for sharing!!! “Pinealitarian Ambientheos” reminds me of Phone Booth Robbers. “Energy Exchange” is like that walk down a creepy corridor, makes you anxious about the next drop! “Dub Flowers” has a brilliant kick. I can smoke to it. In this age of Aquarius, who’d not love “13 Crystal Skulls Festival”? Awesome album! Madetative, deep, relaxing… Sooooo perfect to listen all day long, even to work!! Love It! Every track of this VA comp is excellent listening. Amazing, thanks artists and Ektoplazm! WONDERFUL album. Thank you so much for letting us download it 4 free!!! !